Fudgy, soft, with the intense chocolate flavor that comes from using unsweetened Baker’s chocolate, the Crinkles have a sweet layer on the outside yielding to a slightly more bitter taste inside. They look fancy, but the oven does the decorating, so as long as you remember to make the dough at least six hours before you plan to bake, nothing could be easier. For one thing, there’s no creaming. You melt the butter and chocolate together and then add them to the beaten eggs and sugar before adding the flour. An electric hand mixer does the work – at least until it’s time to form the dough into 80 one-inch balls and roll them in icing sugar. If you have some kitchen elves on hand, that can be very pleasant and social, the kind of simple, repetitive kitchen chore, like shelling peas, or cutting fruit for canning, that we don’t often do any more. I found them in A Baker’s Field Guide to Christmas Cookies, by Dede Wilson, a truly wonderful cookbook that has fueled the creativity of cookie night for several years: the Christmas Mice! the Meringue Mushrooms! If you’re a fan of Christmas Cookies, you need this book. I’ve taken two liberties with the recipe. First, I’ve changed its name. Wilson called them Kris Kringle’s Krinkles. Somehow the initials KKK just don’t say Christmas to me. Right now I’m going with Claus’s Chocolate Crinkles, but I’m open to better names. And as of this batch, I’ve officially stopped making the version that’s rolled in cocoa powder instead of icing sugar. Here’s why. Although we make these cookies every year, they aren’t my favorites. The telling proof? I can keep a container of them in the house and not feel any need to go get another cookie every half hour or so. But other people, including Alan and Marla, always ask for them. Since no one ever mentions the cocoa-rolled version, and they’re always the last to be eaten, I’m not going to make them any more. Expect your hands to become sticky with dough. You’ll have to stop and wash a couple of times in the course of rolling a batch. 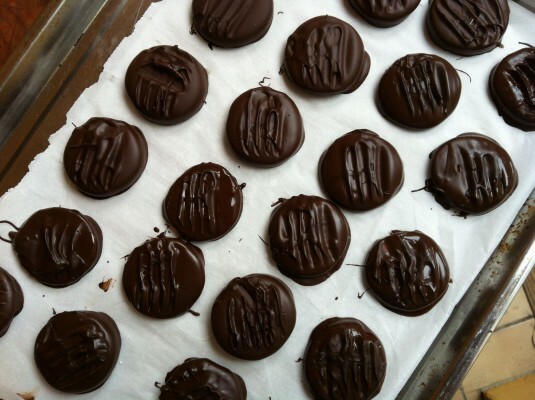 Tomorrow: the best chocolate-covered mints ever. Melt chocolate and butter together in a double boiler – over hot but not boiling water – or in a microwave until about ¾ melted. Remove from heat and stir until completely melted and smooth. Stir flour, baking powder and salt together in a medium bowl. In a large bowl, with an electric mixer on high speed (hand-held is fine) beat eggs, granulated sugar and vanilla together until creamy, about 2 minutes. Whisk chocolate and butter mixture until smooth, and beat into the egg mixture. Add about one-third of the flour mixture and mix on low speed. Gradually add remaining flour, mixing just until blended. Dough may be very thin; it will firm up on cooling. Cover with plastic wrap and refrigerate for at least six hours or overnight. Preheat oven to 350 F. Line 2 cookie sheets with parchment paper. Sift some confectioner’s sugar into a small bowl. If you’re using the cocoa, sift some into a small bowl. 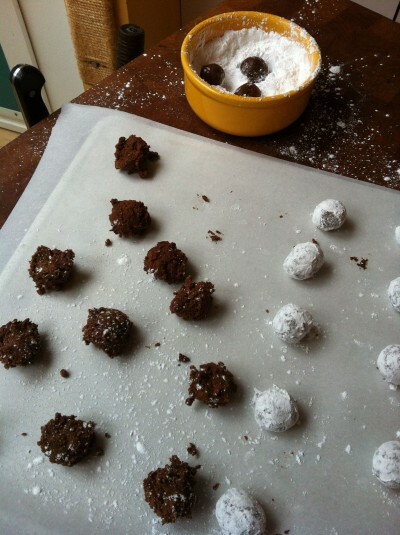 Roll dough between your palms into 1-inch balls, then roll in confectioner’s sugar (or cocoa) to coat completely. 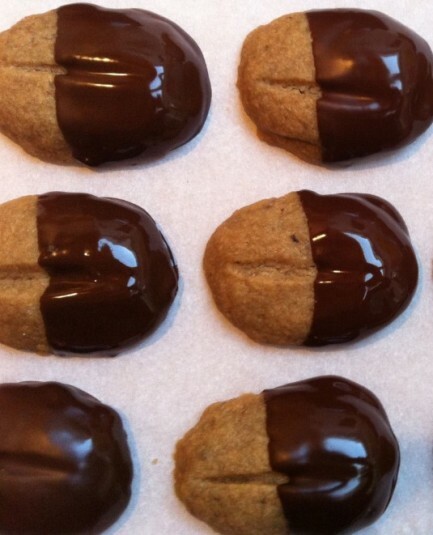 Place the balls 2 inches apart on cookie sheets, and gently flatten so they don’t roll. Bake until puffed and cracked in appearance, about 12 minutes. The centres will still feel somewhat soft. Slide parchment onto racks to cool cookies completely. Store in an airtight container, up to two weeks. Chocolate-Dipped Cappuccino Shortbread: do Christmas cookies get better than this? Imagine a rich, coffee-flavored shortbread dipped in dark chocolate, served cold, so the chocolate snaps when you bite into it. If there’s a better Christmas cookie, I haven’t met it. A caterer called Jane Bailey invented these Cappuccino Shortbread cookies, and gave the recipe to the Vancouver Sun for a story on gifts from the kitchen. She suggested packing them into coffee mugs as gifts. It was one of the best recipes of the year, and shortly after was reprinted in Five-Star Food, the cookbook I wrote at the newspaper in 1993, where it’s gone on to earn an ever widening circle of admirers. I’ve made Cappuccino Shortbread cookies many times, and found them infallible, so I’ve been surprised when other people report having problems with them. As long as you follow the recipe, I think there are only two things that can go wrong. If the dough is too warm, the cookies may spread too much. You can avoid that problem by making sure that the butter is room temperature, and not on the verge of melting. That may mean letting it sit out, rather than speeding up the process in the microwave. 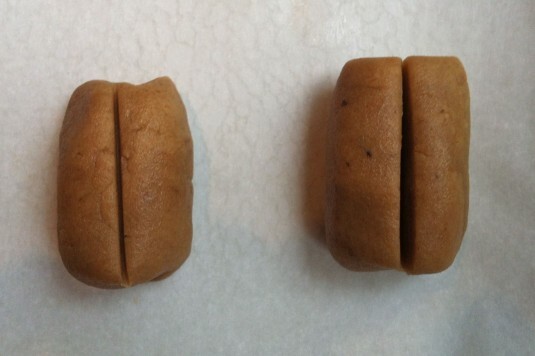 If you cut too deep a line into the cookie with the back of your knife, they will also spread too much (like the cookie on the right in the photos below). One other caution: don’t give in to the temptation to use good quality coffee beans instead of instant, not even if you have to go out and buy a jar of instant coffee to make the cookies. No matter how fine the grind, coffee beans will always stay gritty, and they won’t release their coffee flavor. It’s worth risking the shocked question from guests – “You keep instant coffee?” – to make Cappuccino Shortbreads work as they should. Just buy a wide-mouthed jar, so the measuring spoon will fit in easily. Store it in the back of the cupboard from year to year. You may be surprised how often you find yourself replacing it. Jane Bailey called for dipping both ends, but this presents a problem. It’s hard enough to hold onto the cookie and dip one end without getting chocolate smudges on the shortbread. To dip two ends you’d have to dip them very shallowly, and that would mean a reduced chocolate to shortbread ratio. Who would want that? The original recipe also called for squares of semi-sweet chocolate – supermarket chocolate in other words. Upgrading the quality and intensity of the chocolate is well worth it. Finely crush the instant coffee in your coffee grinder. In a large bowl, cream butter and sugar together. Beat in instant coffee and vanilla. Sift flour and cornstarch together. Stir into butter mixture. The dough is dry. You will have to use your hands to mix it. 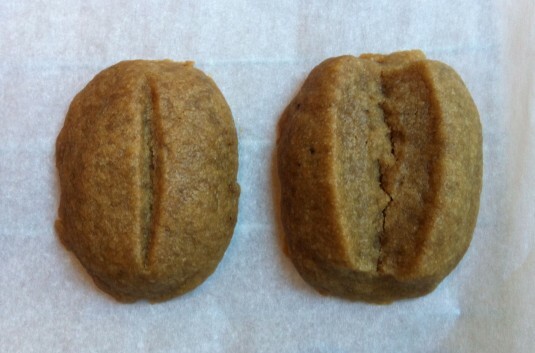 Mould the dough into the shape of coffee beans, using one tablespoon of dough for each cookie. 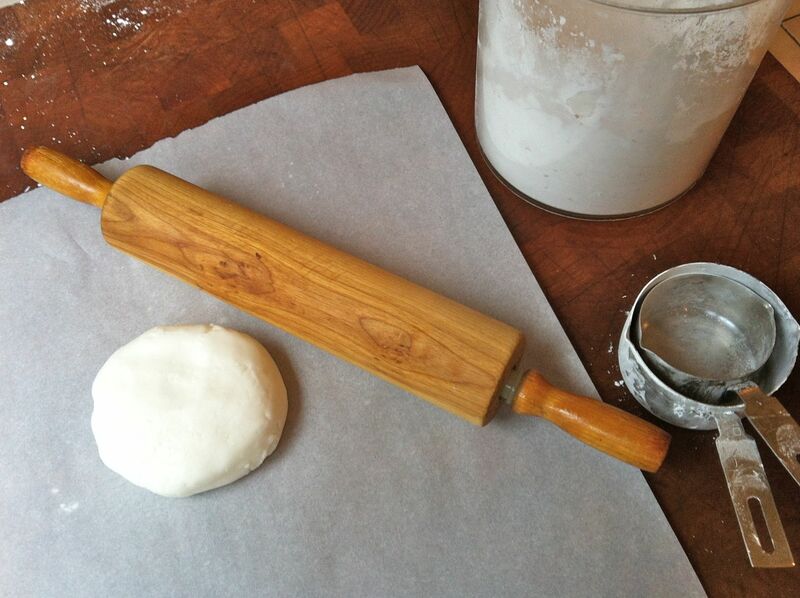 Using the back of a knife, press and indent about 1/8-inch deep, lengthwise, across the top of each cookie. Place on a parchment-paper covered baking sheet. Bake at 325 F for 15 minutes. Slide the parchment paper onto wire racks to cool the cookies. Melt the chocolate. Dip one end of the cookies in chocolate. 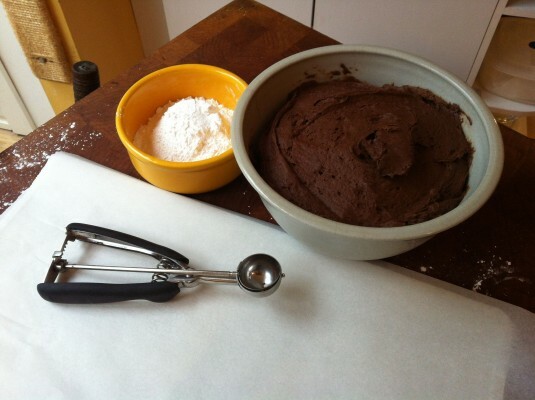 Place on baking sheets lined with waxed paper or parchment paper and refrigerate. 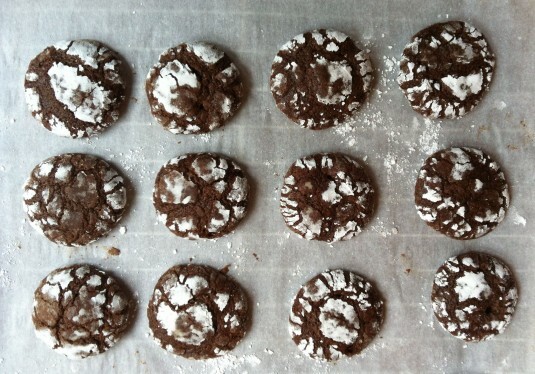 Tomorrow, cookie night recipes continue with Kris Kringle’s Chocolate Krinkles. I no longer know who Betty was, or why we ran her recipe, but I’ve been making Betty’s Traditional Gingerbread since the first Christmas I worked in the food section at the Vancouver Sun, in 1987. I was planning to make a gingerbread house, but I was busy. The dough stayed in the fridge, Christmas came and went, and the moment for gingerbread houses passed. Sometime early in January, I rolled out the dough, cut some cookies, and realized, with enormous pleasure, that this recipe makes truly great gingerbread cookies. They have a subtle spicy flavor, not too heavy, and if you roll them thin and keep them crisp, a satisfying snap. I’m happy to have leftover dough early in January, because they’re good spread with soft cheese, with an apple on the side. And if it’s still Christmas, they’re lovely dipped in chocolate – but what isn’t? And though sugar cookies sometimes make it onto the menu for cookie night and sometimes don’t, gingerbreads to decorate always do. I double the recipe and sometimes end up making it twice. Because the dough keeps so well in the fridge, it’s perfect for pulling out for last-minute guests. You can roll out the cookies, pop them in the oven, and in less than 10 minutes have a house that smells of Christmas. The only thing you need to know is to make them at least a day before you want to bake them, to let the flavor develop. The original recipe called for shortening. I always use butter. And I roll the cookies thinner than the 1/4 inch that Betty suggested. 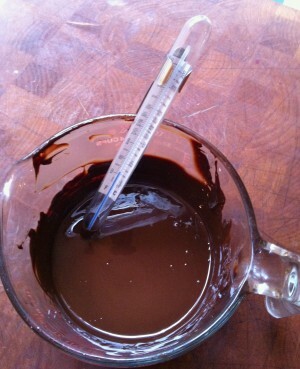 One quick tip: grease your measuring cup before you pour the molasses in, and it will come out easily. Combine flour, salt, ginger, nutmeg, cloves and cinnamon, mixing well. Combine molasses, vinegar and baking soda and add to the butter and sugar mixture. Add flour, part at a time, mixing well. 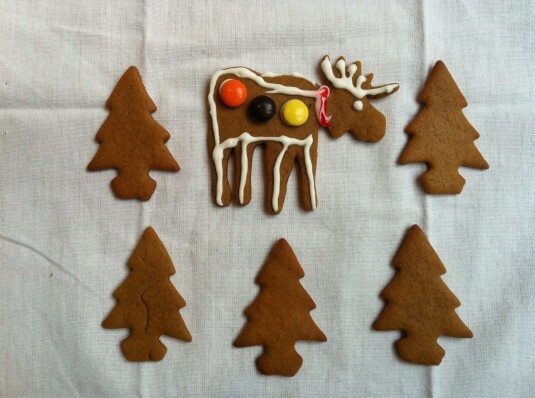 For gingerbread cookies, roll dough out to 1/8th inch thickness on a lightly flour surface. Cut out shapes with cookie cutters. Place cookies on a baking sheet, lined with parchment paper. Bake at 350 F for 8 to 10 minutes. I can’t imagine a better reason to stop blogging than moving house. What could be more disruptive? But it’s great to have you so much closer, only 10 minutes away instead of an hour. All it took for me to stop blogging was the beginning of the fall yoga session and getting the outside of the house painted and repaired while the sunshine lasted. September was noisy, messy, and complicated by schedules that hinged on class times and when someone could be home for the painter and carpenter. Oddly, out of all that, I found my own comfort dessert: an upside-up torte to match your upside-down cake. Just after Thanksgiving weekend, Kevan, the painter, brought a bag of prune plums from his place on Gabriola Island. I love prune plums, and think of them as one of the consolations of fall. I used to make plum crisps, and I still keep a bottle of Slivovitz, Polish plum brandy, in the liquor cabinet, to macerate the fruit with, just in case. But I’m off crisps at the moment. Just between us, they bore me. So I went looking for a prune plum dessert, and found a very simple torte, which, like your upside-down cake, is infinitely variable.Once I followed an online suggestion and added more plums, inserted sideways instead of place face down. It came close to doubling the number of plums, and reversed the ratio of fruit to batter. Excellent! Next I made it with some grapes from a friend’s vines, a little sour for eating, but surprisingly good in a torte. 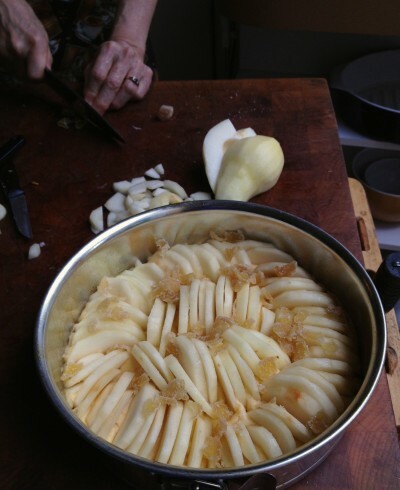 And then last Saturday we made the pear and ginger version: four Bartlett pears, sliced thin, the slices inserted vertically into the batter, the top scattered with a generous amount of thinly sliced candied ginger. It’s the perfect homey dessert recipe: based on fruit, quick and easy, and so simple you can put it together from memory. It can adapt to any season: a peach or berry torte in the summer, a pink grapefruit torte, or even a banana torte in the depths of winter. For bonus points, it freezes well. If you happen to have a glut of fruit, you could make two or three, and bring them out later in the fall. I so understand baking as a psychic anchor. My Mom baked all the time – odd that your Mom didn’t. There’s something sunny and uplifting about flour, sugar, butter and eggs. You get to create an edible, often beautiful, treat. It has a moment of glory, and then it’s eaten and disappears: joy to minimalists everywhere. 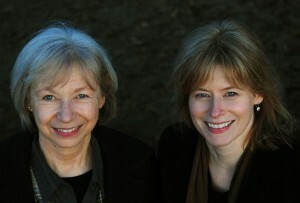 I found this recipe, originally from Marian Burros’s Elegant But Easy cookbook, on Epicurious. It’s worth looking at the link for the story of the recipe, and for the helpful reader comments. 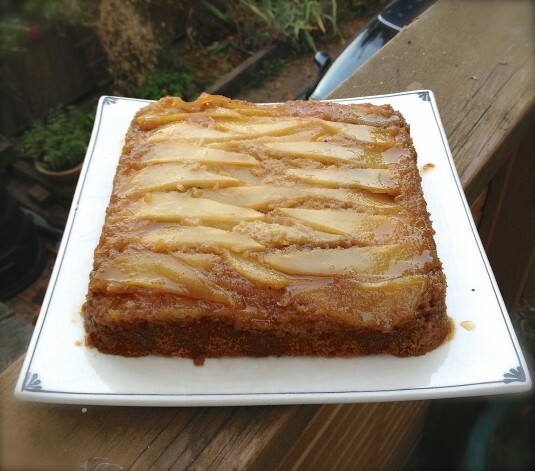 I’m reprinting the recipe here for the pear and ginger topping, and to correct what may be a typo in the original. It calls for an ungreased pan. That’s not a good idea. Grease it. Arrange a rack in the lower third of the oven. Preheat the oven to 350°F. In an electric mixer, cream the sugar and butter. Add the flour, baking powder, eggs, and salt and beat to mix well. Place in a 9-inch greased springform pan. 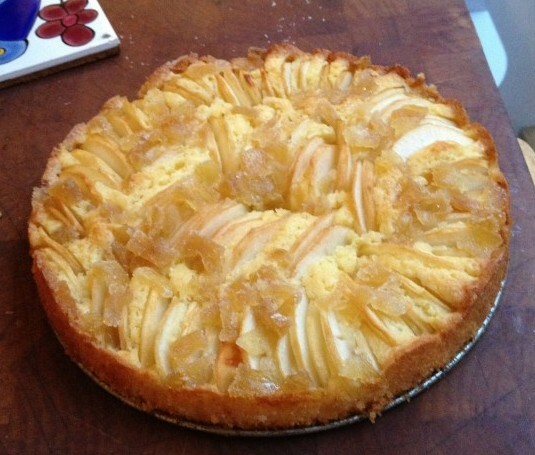 Cover the top with the pear slices, arranged vertically, pushing them down into the batter. Scatter the candied ginger over the pears. Bake for 40 to 50 minutes, until the center tests done with a toothpick. Remove and cool to room temperature or serve warm. Serve plain or with whipped or ice cream. I’m blaming it on the move. The lack of posts lately, that is. To say it’s been hectic around here the last month is an understatement. Moving house is one of those well-known stressful life events. And ours wasn’t just a move but a downsizing. I’m not sure, but my guess is that this ups the stress score a few notches. In addition to the long list of regular moving tasks, with a downsizing there’s a number of questions that need answers before moving day: What is essential to take with us? Will our huge, well-loved sofa fit in the door? What can we shed rather than move into storage? And one question I pondered a lot: If it’s going into storage, won’t we realize in a year that we can get along without it just fine? That’s the minimalist in me talking. With all the long days of making moving-related decisions, it suddenly hit me: With my regular life temporarily turned upside-down, I really needed a few stable things to count on. Anchors to help keep me sane amidst all the changes swirling around us.